Can you believe that Christmas is in only a few days from now? Crazy! It has certainly sneaked up on me this year, although I’ve become more prepared as it’s neared. As I mentioned on Friday, I’ve done some more Christmas baking. Honestly, I don’t have much of a sweet tooth, and I’m a tad overwhelmed with it all. Too many cookies! My husband loves it though, which I suppose is good considering it’s just the two of us and I couldn’t ever eat all those sweets on my own. We did, however, have one bigger project planned. A gingerbread house. I used my modified version of the grain-free gingerbread cookies. It would have worked perfectly if only I hadn’t screwed up. But screwing up is just a part of life, and, well, I guess that’s just how it goes. Even with the absolute mess of it all, I can’t help but share it with you. Besides, the mess is what made it so much fun! Who cares about being perfect anyway? Where’s the story in that? I’m always up for a good story, so this one worked out perfectly! Here was my fatal mistake. 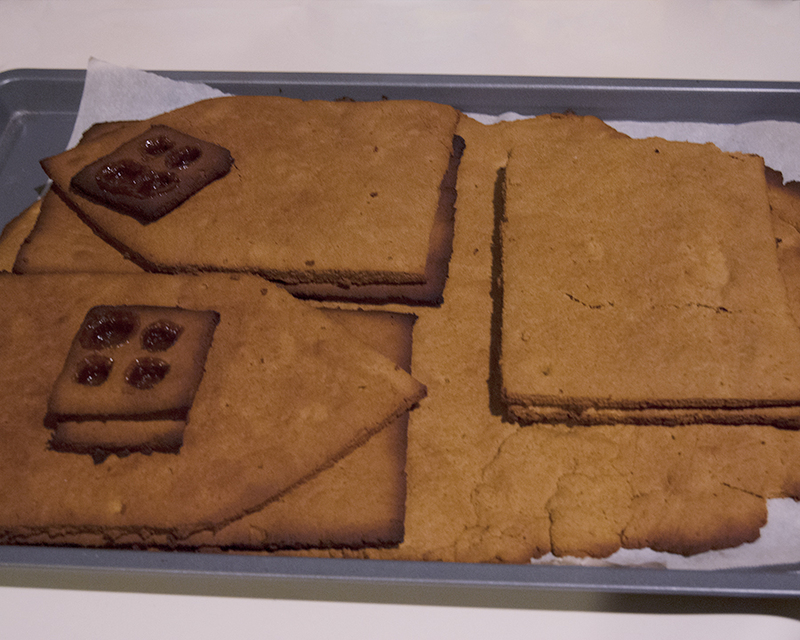 Stacking the house pieces on top of one another, and storing them in the oven–which I inevitably ended up preheating for some other baked goods, and I didn’t realize I left the gingerbread in there until I went to put the other tray in. What difference did that make, you may ask? Well, for starters, the pieces stuck together. This wasn’t overly terrible, I still could have managed–but what really killed it was the softness. They went from nice, sturdy, solid walls and roofs to a soft, soggy mess. Of course, that didn’t deter me, and I decided to proceed anyway. This is what it resulted in. 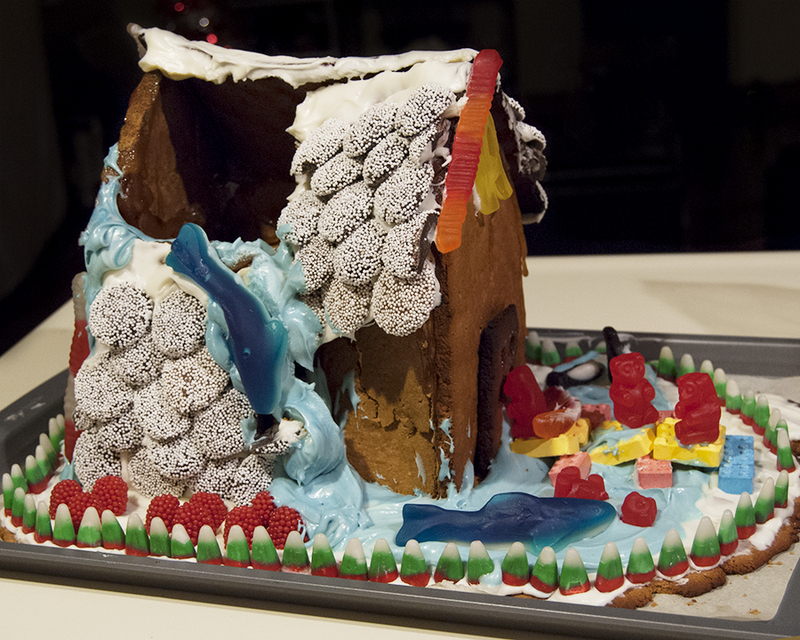 The sugar glue helped, but not enough. Besides, the roof also sagged in. 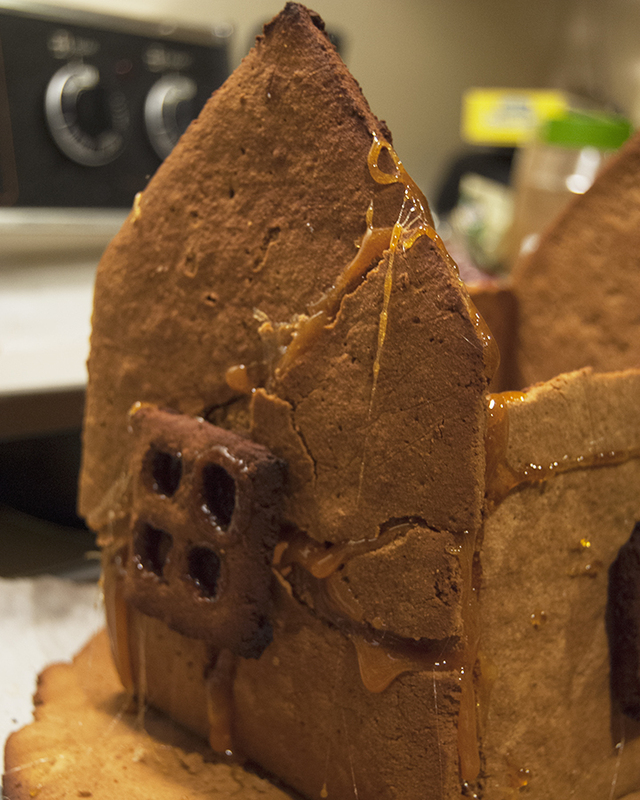 After assembling and beginning to decorate, the roof caved in, or, fell off. So we did a… deconstruction… of sorts, and here’s what we ended up with. We’re saying that a pipe burst, and apparently sharks are hiding in the pipes. Ooo… freaky. Not really sure what else is going on here, but we still had fun decorating! Have a wonderful Monday! I hope our lovely house has brought you just a little bit of joy.